One of the penalties that could be enforced on guilty parties in the eighteenth century was to pay for a public apology and admission of guilt to be published in a suitable local newspaper or newspapers. It seems to have operated a little like plea-bargaining in the United States: a lesser penalty accepted to avoid an expensive and uncertain trial, while still making a public—and shaming—admission of guilt. Whereas I WILLIAM OLIVER, OF Alstone Field in Staffordshire, Licensed Traveller, did on or about the 10th Day of April last call at a Public-house known by the sign of the Chequer, situate in Briston, in the County of Norfolk, kept by Mr JOHN WAKEFIELD; I stopped at the said House about two Hours to refresh myself, and in the mean Time set down my Pack there. I went from the Public-house aforesaid to the Parish of Saxthorpe, in the said County, and there, and at several other Places, I publicly and positively, but falsely and maliciously reported, that LYDIA, the Wife of the said JOHN WAKEFIELD, at the Time I stopped at his House as aforesaid, broke open my Pack, and feloniously took therefrom two Pieces of Handkerchiefs, my Property. Now I do hereby acknowledge that the said Report was, and is entirely false and groundless – I confess I did not at that Time see the said LYDIA, the wife of the said JOHN WAKEFIELD – I am satisfied she was then from Home at Hempton in Norfolk – And I hereby openly and truly declare my Pack was not broke open, nor did I lose any Handkerchiefs or other Property at all. 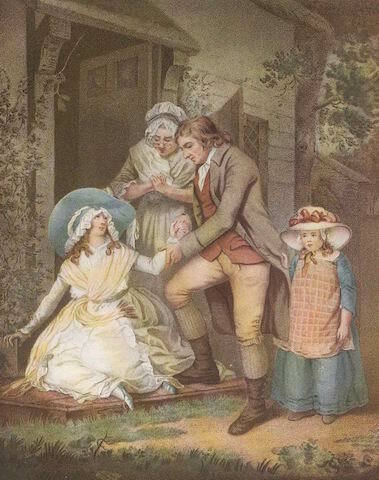 And, therefore, having greatly injured the said LYDIA WAKEFIELD in her Character, I hereby publicly and sincerely ask her Pardon; and I not only consent, but desire this my Acknowledgment may be inserted in the Norwich Mercury, and Norfolk Chronicle, two Weeks, at my Expence, Witness my Hand, the Day and Year above written. WILLIAM OLIVER. To accuse this woman of theft in this way would have been a serious matter. If it had resulted in a conviction, the poor woman could have suffered one of a variety of punishments, from confinement in the lock-up through whipping to death or transportation, depending on the value of the goods stolen. Quite why William Oliver wanted to make such an accusation is never stated. Perhaps the lady had rejected him or upset him in some way; perhaps it was a crude attempt at getting money in exchange for dropping his charge. Fortunately for poor Lydia, she seems to have been able to prove she was absent on the date and time given for the ‘theft’. Overall, I’d say Oliver got off pretty lightly! It’s also worth noting his emphasis on being properly licensed to travel about to sell his wares. Without that permission, he would have been treated as a vagabond under the Vagrancy Act. So many eighteenth-century court cases are for stealing clothing and textiles. I’ve speculated why, but never come up with a convincing explanation. I don’t have a definitive answer either. The best explanation I’ve come up with links the large number of the poor, especially women, who took jobs in domestic service; the custom of the mistress of the house giving her worn out or discarded clothes to the servants to wear or alter; and the ready market for old clothes of all kinds. You could cut of trimmings, buttons etc. and sell them, sell usable fabric to sew into ‘new’ clothes and sell rags for various industrial uses.